Three Bronze Age treasure stories this week with the first being from over on livescience.com, "Silver Tiara Among Treasures Discovered in Bronze Age Tomb" here. 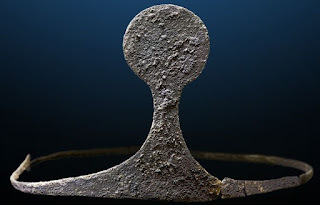 Also, on scienceinpoland.pap.pl, check out the "Treasure of bronze objects from before 3.5 thousand years discovered in Bieszczady" here. Finally, on history.com, "Archaeologists Find Treasure-Laden Tomb of Bronze Age Warrior" here.